This recipe comes from a friend, who keeps a copy of it on a handy Post-It in the kitchen. Put the dry ingredients in a bowl and whisk them together. Put the wet ingredients in a larger bowl and mix them together. Whisk the dry ingredients into the wet ingredients just until blended. Use a ½ cup or ⅓ cup measure to ladle the batter onto a preheated electric griddle, nonstick grill pan, or cast-iron pan (Use a little melted butter to grease the pan if necessary.) If desired, dot the individual pancakes with blueberries before flipping each pancake to finish cooking. Serve warm, passing the butter and maple syrup at the table. 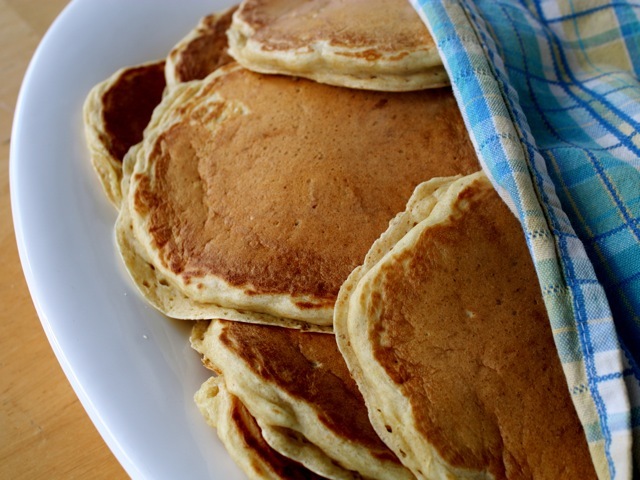 Culinate editor's notes: You can replace the buttermilk with kefir, if you like, although you may need to add a little milk to the batter to thin it.